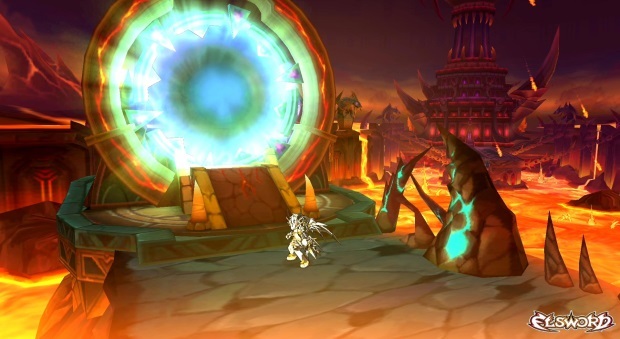 The hit free-to-play action MMORPG Elsword, invites players on a completely new hell-raising experience as the popular Event Dungeon, Gate of Darkness, receives a total overhaul. Created as a portal to Elrios, it’s up to Elsword’s team to thwart the denizens of the darkest realms from entering Elrios. It’s now up to players to close the Gate of Darkness by attacking the gate itself in an all-out epic battle. Groups of dungeon crawlers will be randomly selected to enter the mysterious Gate of Darkness once a boss monster is slain; it’s then that evil will pour from the Gate of Darkness to attack and enter Elrios through a Dimension Portal that must be protected at all costs. However, this feat can not be done alone! If a party has less than four members, a special group of heroes will also join the fight. How will players take on an army from hell . by fighting back with an army of their own! Strategically summon monsters of different types to battle the demons with varying offense and defense characteristics, and no infernal assault on Elrios is complete without a fiendish overlord of unimaginable power. Will our heroes be vanquished when the ultimate evil steps through the Gate, or will Elrios summon a champion of her own to help our heroes? Victors will be rewarded handsomely with amazing Gate of Darkness prizes including new armor, new weapons and more. Shotgun News 12/3: FFXIV, Path of Exile, Tribal Wars 2, and More! NCSOFT today announced that Lineage II’s latest expansion, Helios, is now live for all players.